Located in Zegveld, Promatrix specialises in the production of aluminium moulds and the injection moulding of small to extremely large plastic products. In addition to prototypes for the automotive sector, they make moulds for injection-moulded products for various industries. 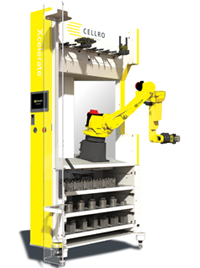 To help support their staff, they fitted various machines with Cellro loading robots. Around 15 years ago, Promatrix set up a process to be able to produce as many moulds as possible each year. As they were having a hard time meeting demand and delivery times, they turned to automation. To meet this need, Promatrix researched various suppliers before ultimately opting for Cellro. The independence and intelligence of Cellro’s automation solutions proved decisive. Promatix started with the Round Cell, linked to two milling machines. The Round Cell exchanges tools, workpieces and clamps. Promatix was so pleased with the automation that it led the company to express further preferences and requirements. This is why they added Xcelerate to their automation solutions a few years ago. Xcelerate exchanges workpieces and clamps along with raw materials. The raw materials are retrieved from the drawer automatically, before being positioned in the clamping unit and loaded into the machine. They are then machined, removed from the machine and clamp and placed back in the drawer. Thanks to this automation, the machining professionals can employ their milling expertise to the fullest, e.g. by ensuring that tricky details are milled properly. Meanwhile, simpler standard operations can be performed automatically. This keeps the employees’ work interesting and reduces delivery times significantly. Want to find out how you can employ automation within your company? If so, take a look at our products on our website knowledge bank or contact us. We’d be happy to advise you on the best options for your company.